Went back home to PA couple weeks ago. Got in late only 4 hours sleep, walk in in the dark, pick a tree that is straight and climb up. I know the area but just picking a tree in the dark is always a crap shoot. About 30 minutes after sun up this beat up guy walks by. 20 yd shot and watched him drop 30 yds away. 8 pt with every tine but one busted, must have had an attitude. Hunted 3 more days and saw 2 doe last night but no shot. Re: Lucky or good ? Congrats! Cool deal right there. Congrats! I'll take lucky over good any day myself. Good story and nice buck! Lucky or Good? Maybe a little of both! 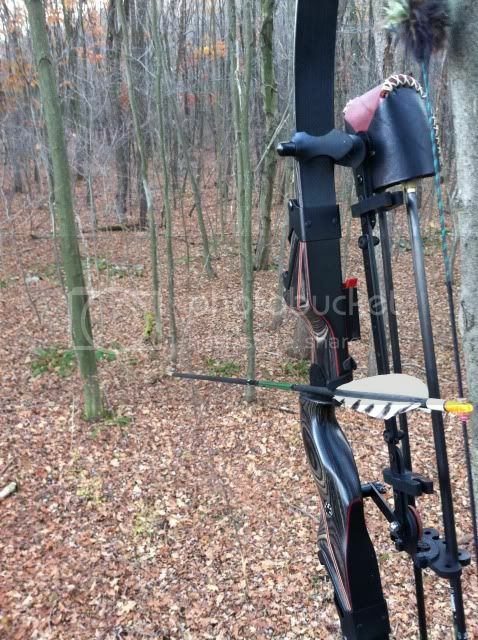 Nice bow, nice buck. With your results I'd take either lucky or good...seems really both go hand in hand. Nice buck! That's cool how much he beat up his rack...I almost got to see a nice ten and eight point fight last weekend and off course didn't get a shot at either, but it was still really cool hearing them grunt and snort wheezing at each other. Congrats on a nice buck!!! Gotta love those morning hunts! Nice buck Mark,Nice bow, Ill be happy when i get limbs for my riser. 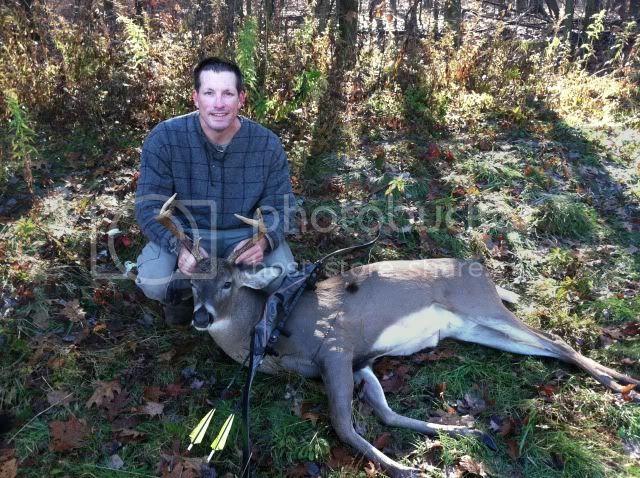 Nice deer and great shot,congrats. Either way, chalk one up in the W column. Congrats!